Need help getting to the venue? Email info@austhealthweek.com.au or view the alternative options below. 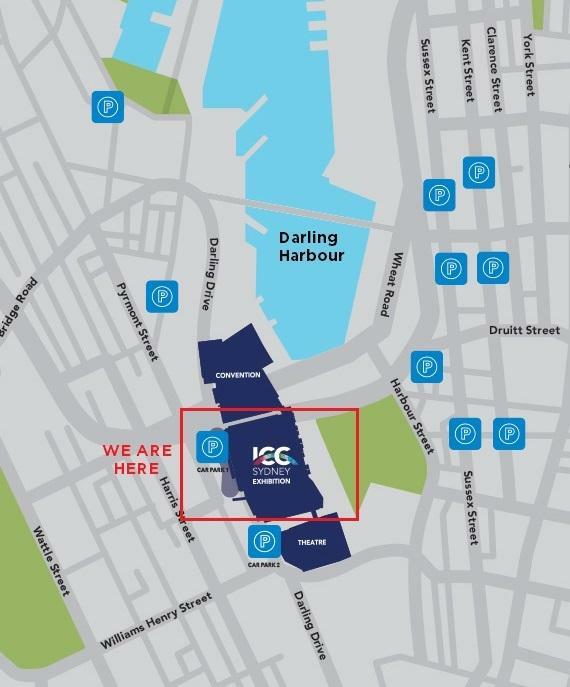 Parking: ICC Sydney has two car park facilities located within the Exhibition Centre and ICC Sydney Theatre, comprising a total of 826 car spaces. Additionally, there are a number of secure car parks located in and around Darling Harbour, the closest located at Harbourside Car Park, 100 Murray Street, Pymont. By Train: A short walk from Central or Town Hall will take you directly to Darling Quarter, Tumbalong Park and Sydney Visitor Centre. Town Hall and Central Stations is a 10-minute walk from ICC Sydney. The Light Rail: This travels right through a number of Darling Harbour stations including ICC Sydney’s stops, Convention Centre and Exhibition Centre. The Light Rail starts at Central Station in the CBD and travels to Dulwich Hill in the inner west. By Taxi: There are two taxi ranks at Darling Harbour; one at Wheat Road near the IMAX Cinema and one behind the shopping centre on Iron Wharf Place. The best taxi drop off and pick up locations include the new Iron Wharf Place and Zollner Circuit, both accessed via Darling Drive. By Air: Flying into Sydney airport Darling Harbour is only 8km from Sydney Airport. With the largest collection of hotels in closest proximity to the ICC Sydney, we recommend for attendees of the Australian Healthcare Week 2019 event to stay at an Accor Hotel with Darling Harbour precinct. This includes the Sofitel Sydney Darling Harbour, Novotel, Ibis or Grand Mercure Darling Harbour. Below is a unique HotelMap that shows our hotel deals at nearby hotels. Clicking on the HotelMap icon gives you instant access to compare, review and book discounted accommodation for hotels in the area.